Last week, on holidays, I finished 3 books and now it is time to get my reviews caught up to date. (I spent a week canoeing in the backcountry with a good friend - no phones, no computers, no internet - bliss!) I read this one in hardcover - I finished it before heading out paddling otherwise it would have been too heavy to make the pack cut. I enjoyed reading The Bishop's Man a few years ago when it won the Giller Prize, so when I heard that Linden MacIntyre was writing a companion book featuring Fr. Duncan's sister Effie, I couldn't wait to read it. It is only recently that I realized that The Bishop's Man was the 2nd in a trilogy that is completed by Why Men Lie - The Long Stretch was published in 1999 - I think that I have just added another book to my constantly expanding TBR list. I had a vague feeling during The Bishop's Man that I was missing a bit of the back story, and that feeling was much stronger during Why Men Lie. The existence of a previous book would explain that feeling! I had mixed feelings as I read this book. I enjoy MacIntyre's writing, so it was a pleasure to pick it up and read his well crafted prose. My problem with the book was the story - there seemed to be no substance to it. Fluff. Effie, a 50 year old professor at the UofT spends the book anguishing over why a boy isn't calling her. This could have been the ramblings of a 15-year-old high school student. I very quickly ran out of patience with her. 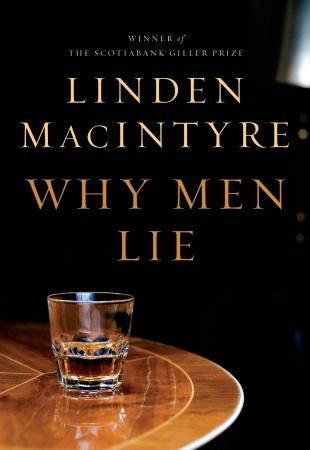 I do think that MacIntyre did a good job, for a male writer, writing in a female voice. Not quite as profound as Richard B. Wright managed in Clara Callen (I really must re-read that book at some point); but still I was able to forget for most of the book that the author was a man. I wonder - is it easier for a female writer to write in a male voice, or for a male writer to write in a female voice? As a female reader, I am amazed when a male writer manages to write a female voice in a believable manner. Not being a male though, I can never tell if a female writer is accurate in portraying a male voice! So I'm glad that I read this book, and I will be hunting up a copy of The Long Stretch. I just wish that there had been more substance to the plot. It was an easy read - perfect for reading on vacation - and pleasurable reading due to the quality of the writing. I have entered myself in the 6th Annual Canadian Book Challenge, and this will be my first of 13 Canadian books read for the challenge. I didn't manage to complete the challenge last year due to a combination of 2 factors - I decided to only count my Canadian re-reads; and with the reading for the Lay Worship Leader course that I am doing, it left less time for recreational reading. Last year (July 1, 2011 - June 30, 2012) I finished 8 Canadian re-reads, but if I had counted all of my Canadian books, I would have easily finished the challenge with 22 Canadian books read. The LWL course is going to last another year, so I'm going to go with the easier version of the challenge - to read 13 Canadian books without putting any limitations on myself!